The Monitor Station is the ultimate desktop monitoring and communications system for your recording studio. Based on the award-winning Central Station, the Monitor Station provides talkback, speaker switching, input source switching and four ultra loud and clear headphone amplifiers delivering everything you need to control your recording environment. The Monitor Station allows you connect up to three input audio streams (TRS1, TRS2, Aux/Phono) allowing you to switch between and compare different inputs. 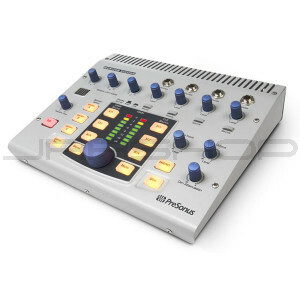 One application is used to connect your computer recording system main outputs to the TRS 1 inputs and a CD player's outputs to the Aux inputs on the Monitor Station to compare your mix with a commercial CD with the touch of a button. Three sets of speaker outputs are loaded on the Monitor Station allowing you to audition your mix on different speakers to take the guessing out of how your mixes will translate in the real world. The Monitor Station allows each of the stereo inputs (TRS1, TRS2, aux) to be routed to one of two audio paths, "main" and "cue". The Monitor Station allows you to route two separate signals (Main and Cue) to each of the four headphone amplifiers.Send a mix with click track to TRS 2 input while sending the "main mix" to TRS 1. You can then enable the headphone amplifiers to listen to either cue or main mix. The main audio path always feeds what you will hear in the control room. Communication during recording is essential. No more yelling when you need to talk to the musicians wearng headphones. Use the Monitor Station talkback system with onboad or external microphone to communicate with the musicians. Headphone Amplifiers that "go to 11"
PreSonus has built a reputation for delivering the best-sounding headphone amplifiers available. Each of the four headphone amplifiers loaded in the Monitor Station deliver 150 milliwatts and are able to power any headphone with as much loud and clear volume needed for everyone in the band, including the drummer.